Here is your BRAIN on DIRECT MAIL — It’s a good thing! There has been a lot of chatter going around about print marketing and its effectiveness — Is print still relevant? Does it reach audiences? Is it worth the time and money? Let me answer your questions in one simple word — YES! Bangor University’s Centre for Experimental Consumer Psychology used functional Magnetic Resonance Imagery (fMRI) to see whether our brains react differently to digital and physical marketing mediums — such as direct mail and printed pieces. 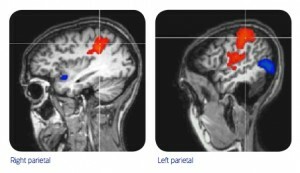 The Red shows brain areas stimulated by physical/tangible ads. 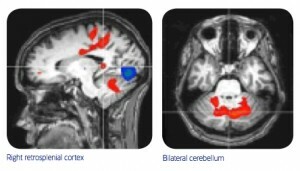 The Blue shows brain areas reacting to digital ads. Tangible materials leave a bigger impression in the brain — and in many more areas of the brain. The emotional centers of the brain react significantly more for paper-based ads. Physical material is more “real” to the brain. It has a meaning, and a place. It’s better connected to memory because it ENGAGES with our spatial memory networks. Physical materials produce more brain responses connected with internal feelings, suggesting greater “internalization” of ads. When your clients and potential customers are handling a tangible material, it feels more “real” in the brain and produces brain responses that trigger emotional reactions that leave a lasting impression in their memory. Want to leave a lasting impression on your audience? Utilize PRINT!